The FPM-5500 model has been discontinued. Please see the DPU91-FLOW Series as a possible alternative or contact our Flow Engineering Department. 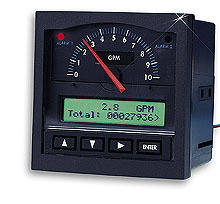 The FPM-5500 flow monitor is a feature-packed process monitor covering the widest possible spectrum of applications. Dual totalizers are calibrated independently of the digital analog flowrate. Reset one totalizer remotely from 100 feet away. Expand the communication range of the system by connecting peripheral equipment to the isolated frequency out, the totalizer pulse output, the alarm contact outputs, or the 4 to 20 mA current output. Packaged in a slim-line housing with NEMA-4X shatter- resistant front panel, the FPM-5500 is the most sophisticated analog monitor available.